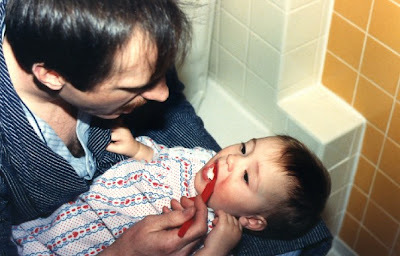 I stumbled across this shot of my Dad brushing me teeth when I was a wee one. Awww. Very precious. That's all for now :) All photos on this website are copyrighted material and all rights are reserved. This means you must have permission to use the photos in any way that does not fall under the limited rights granted by the "fair use" clause of the copyright law. "Fair use" does not extend to taking the photos and putting them on your own website, even if modified and for non-commercial use. This picture almost made me cry - it is so sweet and I love it so much. You can totally see that Dad is doing that thing when he would say, "Say Ahhhhhhhhhhh..." - So cute!!!!!! Senior Proms, Weddings, Milestones, oh my!